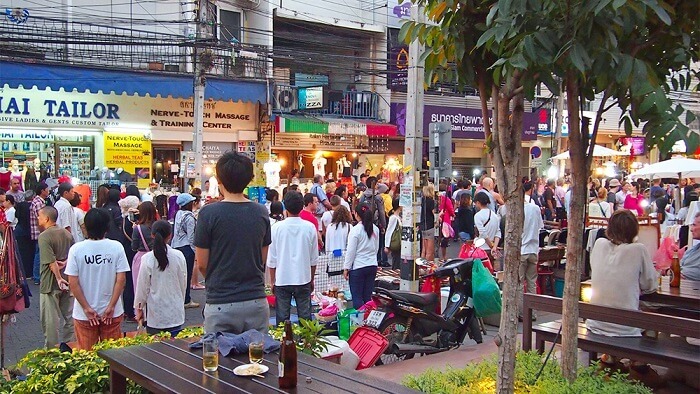 Thailand has become a tourism powerhouse in recent years. Statistics show that around 32 million international tourists visit this South East Asian nation annually. That translates to $71 billion (you read that right, billion) in revenue just from tourism. If you’re planning on booking a flight bound for Bangkok, there are a few things you should know beforehand. Below, we’ll go over the top ten tips for traveling to Thailand so you can make a smooth transition into this exotic country. First on our list of tips for traveling to Thailand is to dress modestly. Although Thailand has quite a reputation, most average Thais are extremely conservative. This is especially true if you’re traveling to the countryside. Women travelers should never wear spaghetti straps, tight-fitting clothing, or clothes that reveal a great deal of skin. Male tourists can wear shorts, but their entire wardrobe should be tasteful, neat, and free of any tears. If you’re visiting a Buddhist temple (aka wat), please wear formal attire. Thais consider it extremely disrespectful for foreigners to enter temples in clothing items like shorts, skirts, or tank-tops. Also, many Thais wear footwear like flip-flops or sandals so it’s easy to take off shoes when you walk inside a wat or a home. Like many other Asian nations, it’s important that you take off your shoes whenever you enter someone else’s house. The only real exceptions to this rule are the cities of Bangkok, Phuket, and Pattaya, but even there you’ll gain more respect if you’re well dressed. Going along with the conservative dressing theme, it’s considered extremely inappropriate to make displays of public affection in Thailand. While it’s becoming somewhat more common in big cities, it’s still quite distasteful for many Thais. Making out in public is a definite no-no, and it will annoy conservative Thais. So, you know, just get a room. Next on our list of tips for traveling to Thailand is the “wai.” Just like in Japan, Thais have a traditional way of greeting superiors that involves bowing. Basically, you have to place your palms together like you’re praying and bow slightly forward. This practice is known as the “wai” and it’s believed to be an Indian custom brought over to Thailand. The higher a person puts his/her hands, the more respect they are showing. You might see people performing the “wai” as they pass by wats. As a foreigner, Thais don’t expect you to perform the “wai,” but it’s good for you to know. If anyone performs the “wai” to you, you can simply bow to accept their respect. Any tips for traveling to Thailand list has to discuss the language barrier sooner or later. Thai is a notoriously difficult language for Westerners to master. It will take a great amount of effort to learn the basics of this language’s unique script and tones. However, even if you master just a few key phrases, you’ll earn a great deal of respect from local Thais. For more useful Thai phrases, check out a Thai phrasebook. This is one of the most important tips for traveling to Thailand. Seriously. Thais don’t take kindly to you disrespecting their royal family. In fact, it’s illegal to slander the King and Queen. If you are caught saying nasty things about the Royal Family, you could face serious time in jail…like 15 to 20 years! This has happened before. A Swiss tourist named Oliver Jufer was sentenced to ten years in prison because he vandalized an official portrait of the former King Bhumibol Adulyadej. Luckily for Jufer, the King pardoned him. The moral of the story: don’t do anything to disrespect towards the Royal Family. This might be one of the oddest tips for traveling to Thailand, but its important for Westerners to remember. In Thai culture, the head is the most sacred portion of the body. For this reason, Thais consider it a sign of disrespect if you pat them on the head. Even if you innocently pat a kid on the head, it will be interpreted in a negative way. If you accidentally touch someone’s head, ask for their forgiveness right away. On the other hand (or foot, rather), Thais have the exact opposite association for the feet. For this reason, never touch others with your feet and never point your feet towards Buddha statues. It’s also considered inappropriate to step over someone who has outstretched feet. Either politely ask them to move their feet or move around them. Theravada Buddhism is the heart of Thai culture. About 95 percent of the Thai population practices this old form of Buddhism and every man is expected to practice meditation in a monastery for a few months. No matter where you are in Thailand, you’ll have the opportunity to offer food to the monks in the morning as they go on alms round. Women who want to offer monks food must put a cloth on their offering or give it to a lay attendant. According to the monastic code (aka Vinaya), monks are encouraged to stay as far away from women as possible to avoid sexual temptation. If you want to offer money to monks, don’t hand it to them while they’re on alms round. As a part of the Vinaya, monks are not allowed to handle money. You can, however, put money in an appropriate donation box while visiting a wat. The Thai government plays the national anthem every day at both 8AM and 6PM. You’ll even see this anthem played on TV and hear it on the radio. If you’re in a public area when this happens, you should stand still for the entirety of the broadcast. Thais don’t like it when Westerners disrespect their national anthem. You’ll also have to stand up for the royal anthem when it plays before movies. If you want to impress Thai locals, memorize the national anthem’s lyrics by listening to this video over and over again. Thai cuisine is known around the world for its exotic aromatics and spicy flavor. Many Westerners are surprised that Thais don’t use chopsticks like in other Asian nations. Thais prefer to use forks and spoons at mealtime unless they’re eating East Asian cuisine. If you’re eating out with others, expect to get a plate of rice and a bowl of soup of your own. Usually the main dishes are placed in the center of the table and you’ll have to share with those around you. Unlike in Western nations, it’s not impolite for you to start eating even when others don’t have their plates. We’ll end our list with a fun suggestion: visit during a major festival. One of the most beautiful festivals of the year is the Lantern Festival in Chiang Mai every November. As the name suggests, people taking part in this festival light paper lanterns and send them into the river at night. You’ll also get to see a few parades and fireworks displays during this gorgeous annual event. For those who don’t mind getting a bit wet, you could visit Thailand in April to take part in the Water Festival. This nationwide festival is a huge water fight lasting between April 13th and 15th every year. A few other festivals to keep on your radar include the Buffalo Racing Festival in October, the Chinese New Year in January, and the Candle Festival in July. Oh, before we wrap this list up, here’s one last tip: bring plenty of mosquito repellant and sunscreen. You’ll thank us once you get to Thailand.